The sun isn’t out yet, but the streets are filled. The early morning air is humid, warm, and smells of petrol. Locals are loading their bicycles with bundles of leafy green produce, baskets of pineapples, stacks of woven mats, and buckets of flowers. I turn and see collections of balloons, candies, and toys draped on other bicycles like ornaments on a Christmas tree. A bike carrying a 20 inch TV casually pedals by. Not the fancy new LED flat screen, but an old school retro tube that easily weighs 50 pounds. The amounts of goods carried on two wheels is impressive. 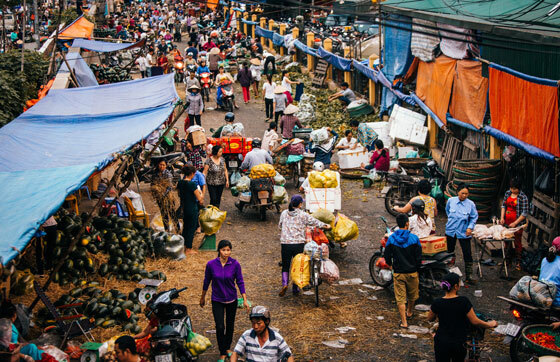 I’m in the Old Quarter, near the west end of the Cau Long Biên bridge, the hub of Hanoi street commerce and a distribution center of fresh produce. 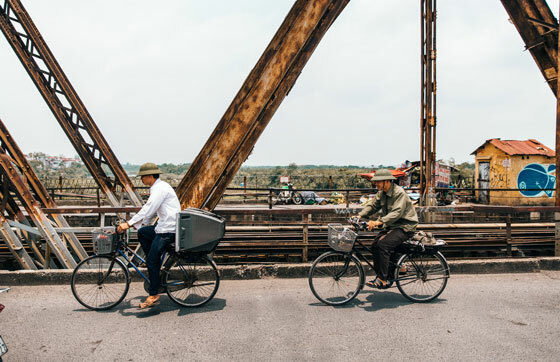 Though the transportation of choice is dominated by motorcycles, there are still some pedal-powered warriors on steel horses braving the busy streets of Hanoi—fully loaded, TV and all. 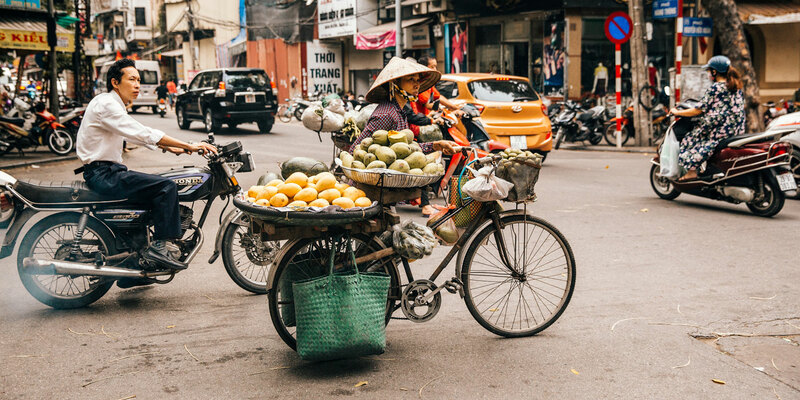 As late as the 1990's, Hanoi experienced quieter streets, with bicycles being the main mode of transportation. In Hanoi, the motorbike revolution all but completely replaced the bicycle. In 1995, 47% of journeys were made by bicycle; in 2008, the figure had dropped to only 3%. Though their dominance has decreased, bicycles remain interwoven with the city commerce. Street vendors carry and sell anything from flowers to raw meat. Their bicycles are so overloaded, they can’t even ride them. Some are rusted out to the brink of crumbling, without pedals or a seat. Stripped down to the the bare essentials—two wheels, only to be used as a mobile fruit stand. There is no flow in the city, but at the same time there is flow. Fortune favors the bold when maneuvering through the streets of Vietnam’s capital. There is a chaotic order in how motorists and cyclists navigate the town, around each other, and around pedestrians. In the Old Quarter, it’s a free for all, without clearly defined lanes. Drivers cut each other off, but there is no outward animosity amongst them. Sometimes a head nod, but rarely a honk of rage. Crossing a busy street as a visitor in this foreign place with a sea of bicycles, motorbikes, and taxis veering in every direction, is an event in itself—worthy of celebration after any successful crossing. Even without any regard for speed limits, traffic signs, or general road courtesy, the mobility of traffic continues to flow in an orderly, chaotic movement. 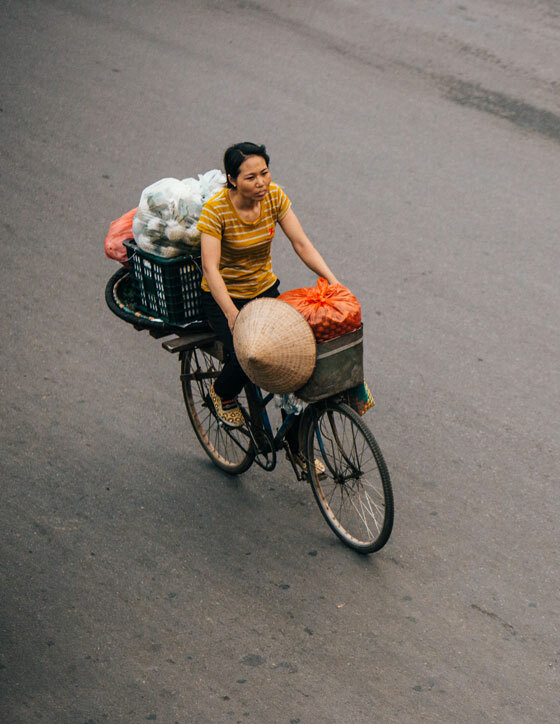 Bicycles played a major role in Vietnam’s history—from wartime, to commuting, to commerce. The motorbike revolution has sped things up in the streets. With a dense population and congested streets, Hanoi is not built to withstand an automobile revolution. 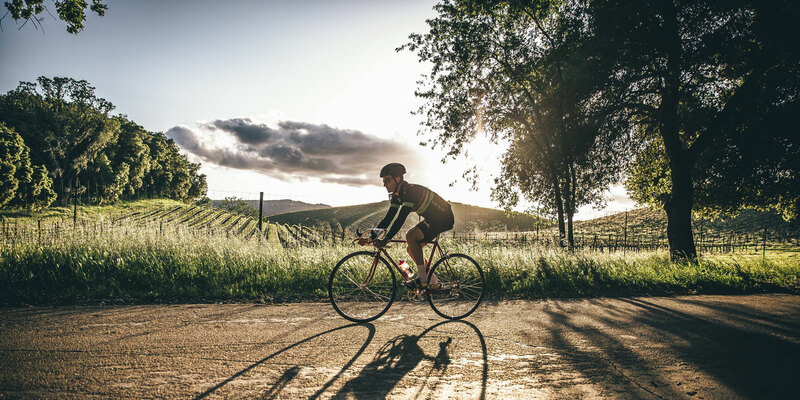 Two wheels will remain the antidote of gridlock. 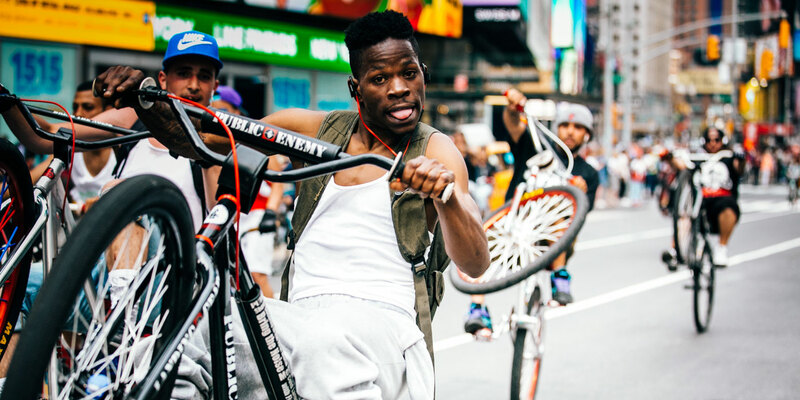 Although motorbikes will continue to dominate the streets, bicycles remain a staple to the heart of the bustling city.